We’d love your help. Let us know what’s wrong with this preview of WITHOUT LAND by Sara F. Hathaway. To ask other readers questions about WITHOUT LAND, please sign up. I really enjoyed writing this book! 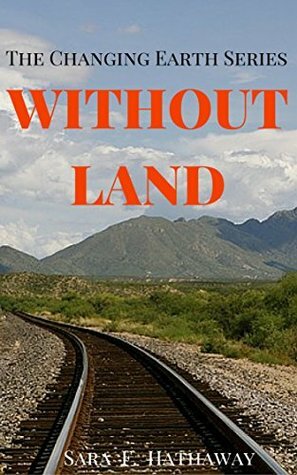 Without Land is book number two in The Changing Earth Series. A series that focuses on the changing landscape of the Earth and how humans will have to adapt. The lone survivor from Sacramento, Erika, is a tenacious woman, mother and wife. After her grueling journey of survival during The Day After Disaster, she thought America would let freedom reign forever but nine years after the Great Quake the reaction by the American Government was quite different. The Gr I really enjoyed writing this book! The Great Quake introduced many hardships to the world. Oil supplies, energy supplies, food supplies, medical supplies and all the essentials of modern life have been disrupted. The American citizens fought valiantly to bring back some sense of normalcy in a world that was shaken to bits but had to face some tough choices along the way. Citizens still in possession of viable land found themselves farming and fulfilling many obligations for the citizens left alive. Many more people were left landless and instead of allowing them to roam in packs, the government rounded them up and housed them in refugee camps. The government quickly enacted new policies to maintain order. Only landowning citizens were allowed the right to vote on these new policies. The refugee families were signed up to an adoption program. The landowners were given the right to pick and choose individuals and families to house on their property. This way the refugees could provide manual labor for the farms due to the shortage of oil to fuel machinery. The final blow to the hearts of refugees was the introduction of the "infertility" law which stated that any landless refugees would be rendered infertile after the age of thirteen. It was voted on and passed to maintain population levels in this world desperately trying to recover. Erika and her family are just another group left landless and forced to find their way in this new government construct. Even though they fought bravely against the new system, their lives have been put on hold as they stay trapped with their family and friends at the Las Vegas Refugee Camp. Avoiding adoption, the crew constantly focuses on gaining their freedom. One day they are called upon to join a rescue team and upon doing so they think this a way back into the good graces of the tyrannical government. However, the truth is not always what it seems and Mother Nature will always have the last word. Erika Moore is the sole survivor of Sacramento in the Day of Disaster, Sara’s prequel to Without Land. Erika endured a lot when the unthinkable happened to this planet and life as she knew it disappeared. But, that was nothing compared to what she has to endure now. Erika is a rebel, but she is also a wife and mother, living in what is left of Las Vegas. The new government has zero tolerance for misfits. That tag fit Erika perfectly and she fought back. What she could do was however limited. Eri Erika Moore is the sole survivor of Sacramento in the Day of Disaster, Sara’s prequel to Without Land. Erika endured a lot when the unthinkable happened to this planet and life as she knew it disappeared. But, that was nothing compared to what she has to endure now. Erika is a rebel, but she is also a wife and mother, living in what is left of Las Vegas. The new government has zero tolerance for misfits. That tag fit Erika perfectly and she fought back. What she could do was however limited. Erika had to think about her family as well. And, basic survival was a major struggle. This place was literally a prison and rubbed against every fiber of her being. She longed to escape, but could she? What would she find if she could? She had no idea what the world had become over the years. I thoroughly enjoyed Without Land and the story is well written. It may be a survival story, but it is also about love and family. Pick up a copy. You won’t be disappointed.